Beautiful spacious home built in 2014. Open floor plan with upscale finishes located in the heart of Leland.Just a couple of short blocks to the water, beach, Main Street and Fishtown. 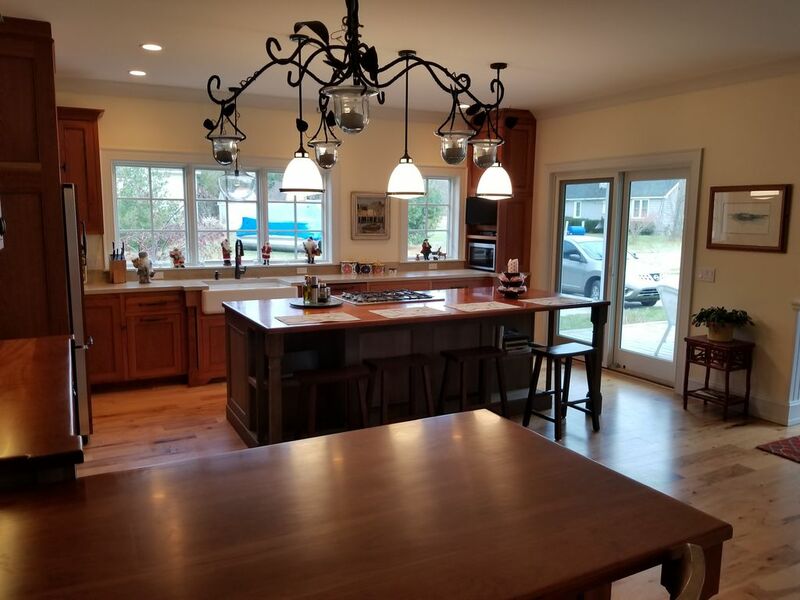 Four bedrooms, three full bathrooms, gourmet kitchen with stainless steel appliances, finished lower level family room with flat screen HD television. Large yard with two porches & plenty of space for grilling out & relaxing. Enjoy the wonder of Leland with your family and friends in this prime home away from home! We just purchased this home, and it is the first season it is being rented. We will be using it ourselves for less than half the summer, so are making it available the other weeks! The pictures really under-sell this place! It was a beautiful home to spend our vacation in. Everything about this place was relaxing and it was easy to move in and get settled in quickly. Spacious, bright and in the perfect location! It’s impossible to not love Leland but this home sure makes it even more enjoyable! We walked and biked to eat, to the beach, to get coffee at Blue Boat, treats at the Dam Candy store, to watch the sunset, you name it. There’s plenty of room to spread out and we loved having enough space to host friends for dinner. The kids loved the fire pit for post sunset s’mores and we loved it to keep the chill off and the bugs away. Loved every minute of our Leland vacation! This house had no ratings when we chose to rent- as it was new for this season. We loved the location but we did not know what we were in for. Well it was a home run, a true gem. Fabulous! The house was on a quiet street with a mini beach at one end and is Close walking distance to a charming town, restaurants, famous Fishtown and some beach options. We invited our adult kids, 2 young grandkids and a senior dad ( great grand!) and there was lots of space and lots to interest everyone for the week. The Walkers have an upscale kitchen , clean rooms and beautifully furnished home. (And not cluttered with nick nacks!!). We would absolutely stay here again if visiting North Michigan, and recommend it without reservation. The only suggestion we can make for the owners is to have a second tank of grill propane available. The gas was empty the first day we went to grill and we were really stuck with dinner steaks and no gas. Not really that huge but a detail worth addressing in the future. In every other way the owners were quick to respond and very helpful.